Happy New Year to you all. 2013 has been an incredible year for the THHN – so much amazing support for what we do and what we are trying to achieve for the future. Thank you to everyone who has helped in any way at all. 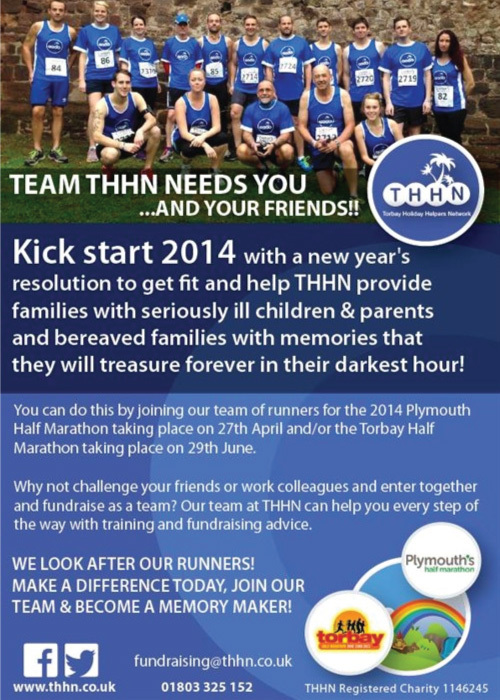 We are a team and hopefully 2014 will be another great year for this charity that so many have now benefited from. Rather fittingly our incredible new caravan, courtesy of the Miss World Beauty With a Purpose charity, is home to a THHN family as we start the new year. Receiving this was a real highlight of 2013 and it has already been extensively used. We hope that the family referred by Scottish charity CCLASP have a happy holiday and we’re sure that they will be the first of many families in 2014 to enjoy this fantastic facility. 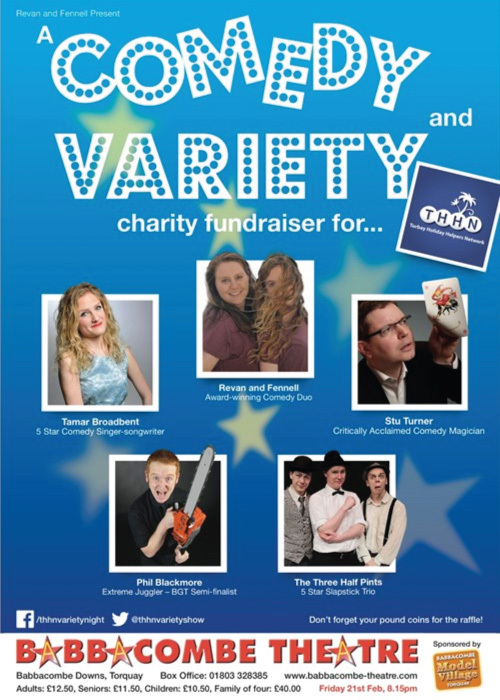 As we look ahead to 2014 we’re starting with a great event – The THHN Variety Show at Babbacombe Theatre on Friday 21 February. With comedy, music and magic it should be a fantastic night out, kindly sponsored by Babbacombe Model Village. Book online at www.babbacombe-theatre.com or call 01803 328385 Prices are: Adults – £12.50, Seniors – £11.50, Children – £10.50, Family of 4 (2 adults, 2 children) – £40. As we start a new year it seems like a good moment to remind everyone about the bungalow project that we announced in 2013. This is our biggest challenge to date and will require some giant fundraising. This project is the next step for the THHN. We already provide holidays for as many families as we can but there’s nothing we can offer families with very high-level care needs. Our own bungalow, with every possible facility, is the way forward and if you can help us raise funds or think you can help with this project in any way at all we would be so grateful to hear from you. I would like to offer my sincere and heartfelt thanks to each and every supporter, volunteer and fundraiser who has supported us through 2013. This truly has been the most incredible and successful year in our short 4 year history! What we have achieved this year is just incredible, thanks to you. We are a little charity with a massive heart, that has beat harder than ever this year and next year it is going to pound! I never in my wildest dreams envisaged that THHN would come this far. Since I offered our first free holiday in 2009 we have collectively helped 370 more families to enjoy quality time together on holiday, giving them a positive distraction and chance to build some very special memories that they will treasure forever, and for some has helped them through the very dark days that have followed. In 2014 we will continue to drive forwards with our bungalow project, we need to raise the best part of 1 million pounds and we cannot do this without your help! Your help can come in so many ways, no matter how small, it may be just by sharing our posts, inviting your friends to like our Facebook page or just telling your friends about us. 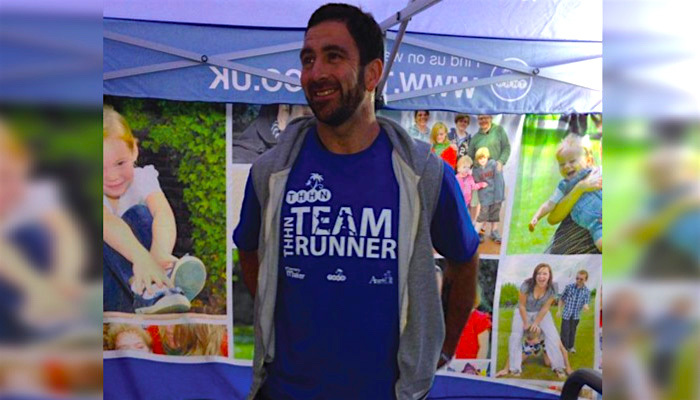 If you wanted to go a step further and fundraise we would love to hear from you and can give you all the advice you need to get you up and running. I would like to wish you all a very happy and peaceful 2014 and again I really cannot thank each and everyone of you enough for your incredible support – the world truly is a generous and caring place, lets keep improving and helping others together. Best wishes for a very happy New Year and much Love – Luke Tillen. Miles Leeson, owner of Peak Performance Gym in Torquay, who gave a holiday to Eurodisney to a family with a little boy suffering from Neuroblastoma who were referred by the Exeter CLIC Sargent team. They had a wonderful time. Breakwater Bistro where ‘Cool Ice Cream Bananas’ Gorilla is currently residing and has a collecting box to raise money for us. Volunteer Carolanne Hart who ran a THHN stand in two beach huts in Torquay and raised a brilliant £118.95. Everyone who sponsored Glen on his epic challenge, including Simon Murray and the Torbay Hotel who donated and Palm and Gliddon Ford Service who put together a great ad publicising the event. Babbacombe C of E Primary School who held a Christmas mufti and cake sale for us. Thanks too for the cheque for £263 which was given to Luke at their assembly and which represents the total of their fundraising efforts so far – wonderful. All of the volunteers who helped out with our stall at the Babbacombe Christmas Street Party in Reddenhill Road. Trustee Martin Brook and his family who sang carols at Sainsbury’s in the Willows, Torquay, to raise money for us. The wonderful ladies of “Yours in Harmony” who also sang outside Sainsbury’s for us this month. The Christian/Knapman family who ran a THHN tombola at the St Marychurch Christmas Street Party raising a great £106. Brunel Manor who gave a Christmas break to a family referred by the mid Devon children’s community nursing team, along with local company Bear Mountain who donated and wrapped gifts for all 9 members of the family. And of course to all of our incredible catering suppliers who went the extra mile in providing some stunning festive food hampers! The Buccaneer Inn of Babbacombe who raised £302 with their Christmas raffle. Over the Rainbow Cake Design, Halletts the Bakers, Save on Meats Torquay and Total Produce Devon, Riverford Torbay and South Hams, D&H Fisheries, Luscombe Butchers of Totnes and Claire’s Cakes for the wonderful goodies given this month. Crazy Carolanne Hart and and the Donnelly sisters who did a bonkers Boxing Day dip in the sea to raise money for us – the things people do! They have raised over £1,000.00 so far!!! We get lots and lots of thank you letters from the families who have THHN holidays. If ever you wonder if the work that we do makes a difference take a bit of time to read some of them. We put them on Facebook and our website and often the families themselves write to the Herald Express who kindly always publish them. Reading what some of the families say about the wonderful family time they’ve had together inspires us to try ever harder to provide more holidays for more families. If you have a spare moment take a look at /family-feedback and see quite what a difference this inspiring network we’ve all created actually makes. Thank you so much to everyone involved and here’s to another year of doing our little bit to help where we can.